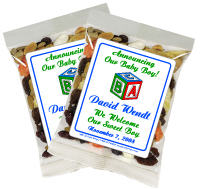 Party Wraps would like to help you announcing a new addition to the family by selecting one of these unique birth announcement favors! 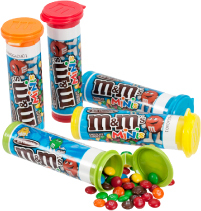 Our special personailized favors are perfect for family and friends to enjoy and cherish for a lifetime. All of your loved ones will be so excited that the favors add a special element to this special event. 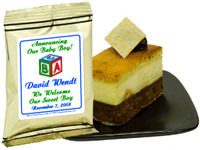 Any one of our favors are sure to say it all and help celebrate the welcoming of your newest family member! 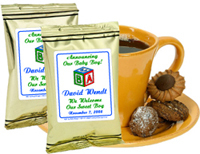 Some our favors include edible sweets, mint favors, beverage favors, peel and stick labels and more. 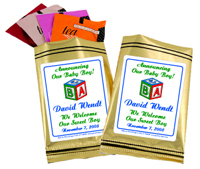 Candy bar wrappers, Tic Tac mints, bookmarkers, and popcorn wrapper favors are among our most popular birth announcement handouts. 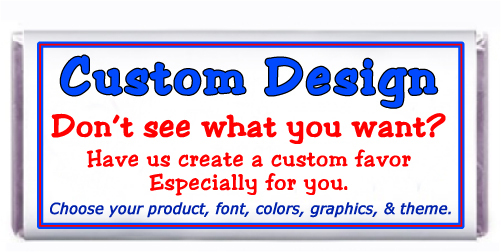 Party Wraps birth announcement designs can be personalized with any theme.